This post is sponsored by Lowes. 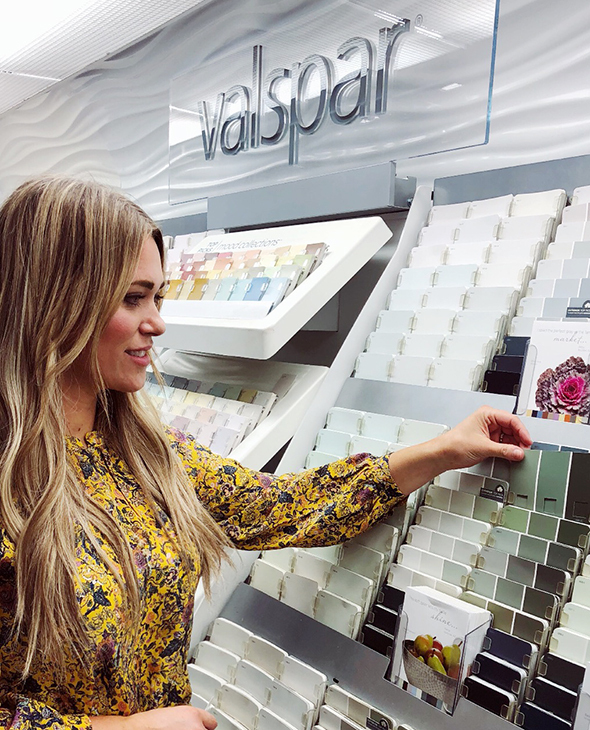 I was shocked at the number of ecstatic messages I got this week when I announced on stories that Lowes invited me to makeover a bedroom, and challenged me to use any color BUT WHITE! I had a feeling you guys would be excited to see color on walls for a change, because I feel the same way! As much as I love using and seeing photos of white walls, I’ve been feeling the itch to bring back color in my home. 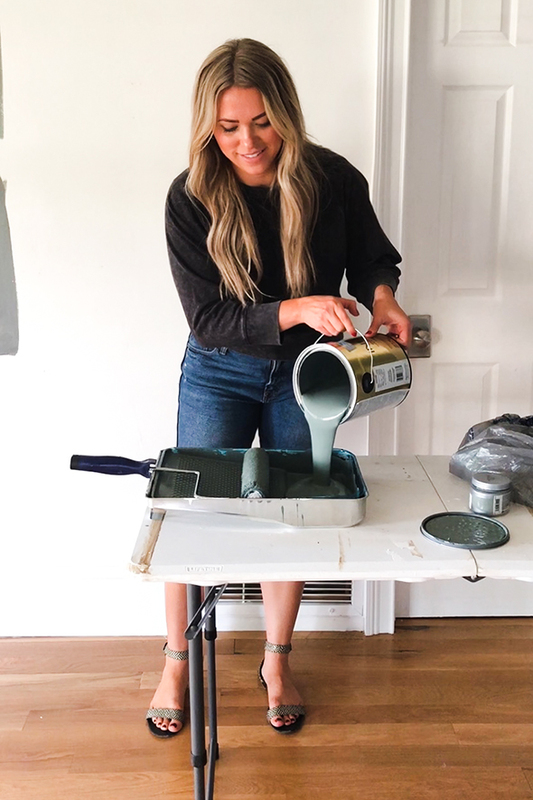 Today I’ll be sharing my best tips for picking the right paint and paint color for your space and my super fast and efficient technique for getting a room painted! 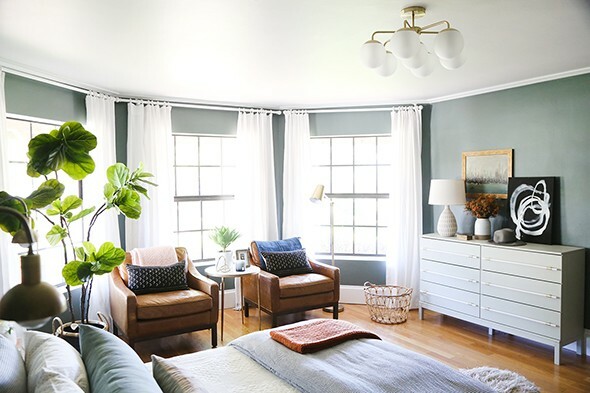 If you’re a little unsure how or where to incorporate a dark or saturated paint color in your home, bedrooms are a great place to start! 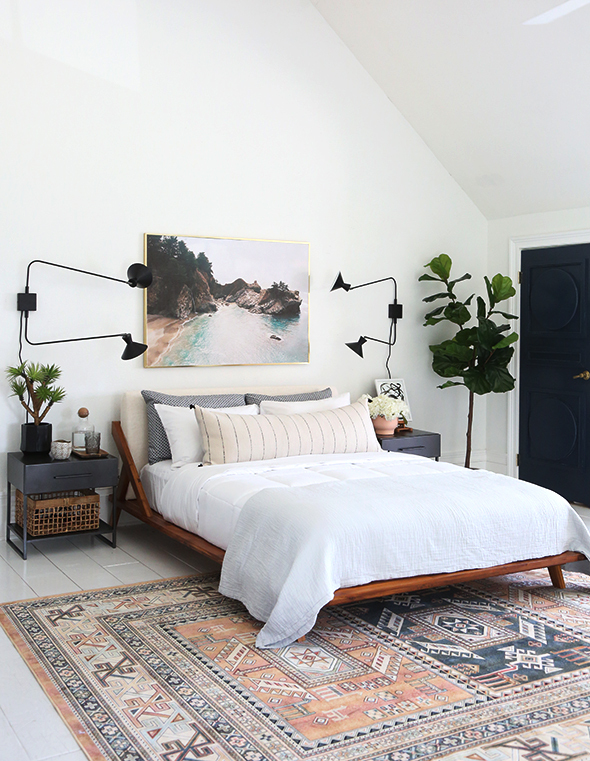 Michael and I will be using our former play room as our bedroom during the renovation and after that we’ll be using it as a guest room, so I was excited to give this space a brand new, more grown up look. We had some serious water damage on the ceiling that ruined the wallpaper a couple of months ago so it was time for a change in here anyway! 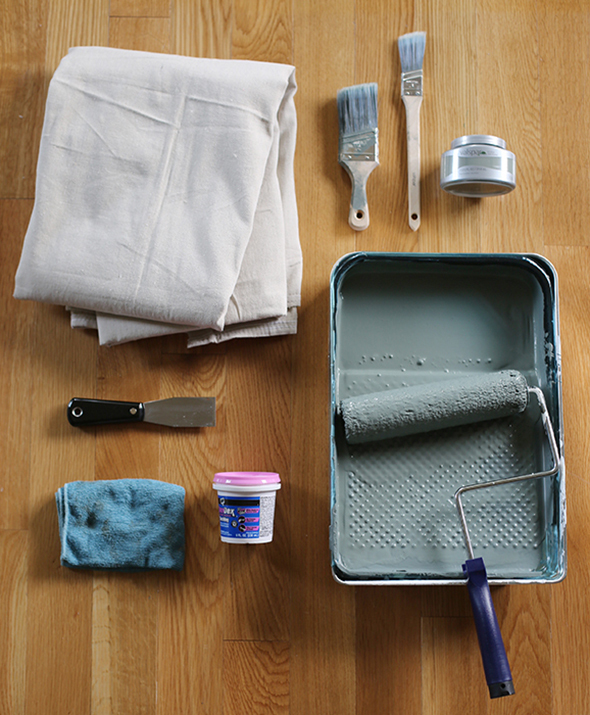 TIP #1: Pick your paint samples with your existing decor and flooring in mind! I always like to start any decorating project by finding the right rug first. That’s the hard and expensive part! 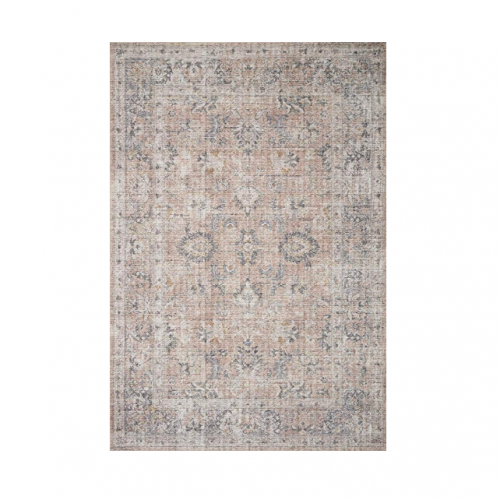 Finding the perfect paint color to work with your rug is the fun and easy part! My plan was to reuse the furniture we already had in our former guest room and other spaces in our house. Here’s what our guest room furniture looked like before in another part of the house. 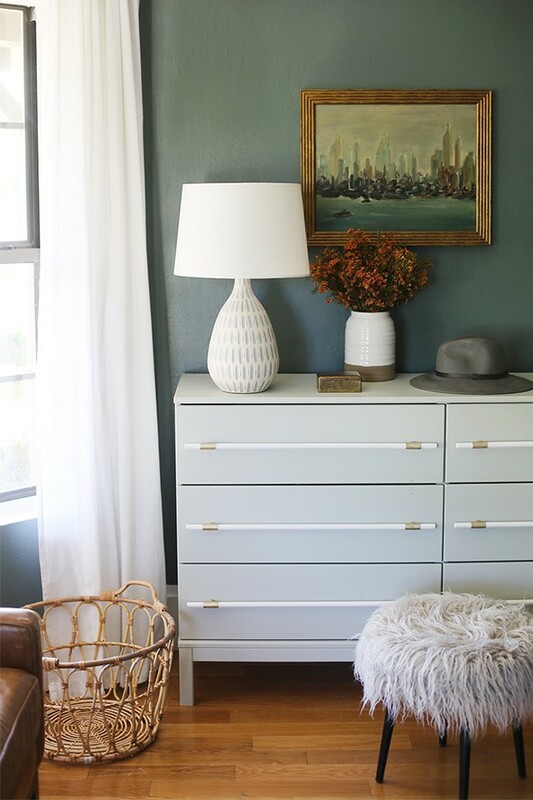 Isn’t it crazy the same furniture and rug looks SO different next to the new paint color! 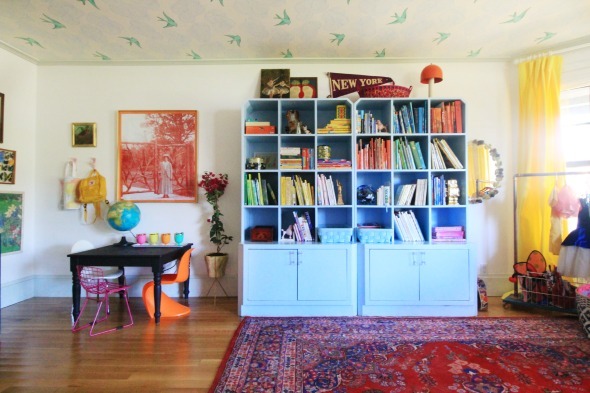 Painting your walls is such an easy way to give new life to your old things! 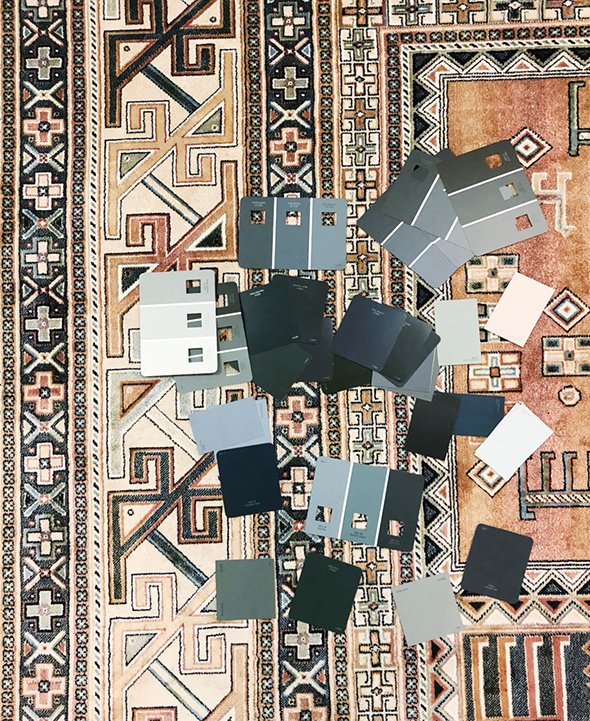 I went to Lowes with a general sense of what I was looking for and grabbed a bunch of paint chips in the dark greens and blues family, referencing photos of my rug in my phone while I was pulling. When I got home I laid out my paint chips and narrowed the selection down to four favorite colors. 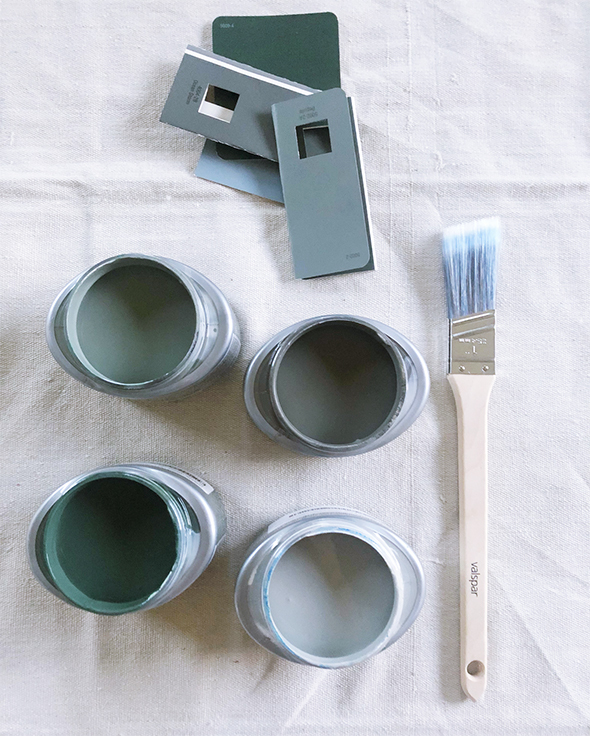 We live close to a Lowes so it was easy for me to swing back in and grab my sample pots, but did you know it’s SUPER easy and inexpensive to order paint samples online? I love that Lowes offers this option! 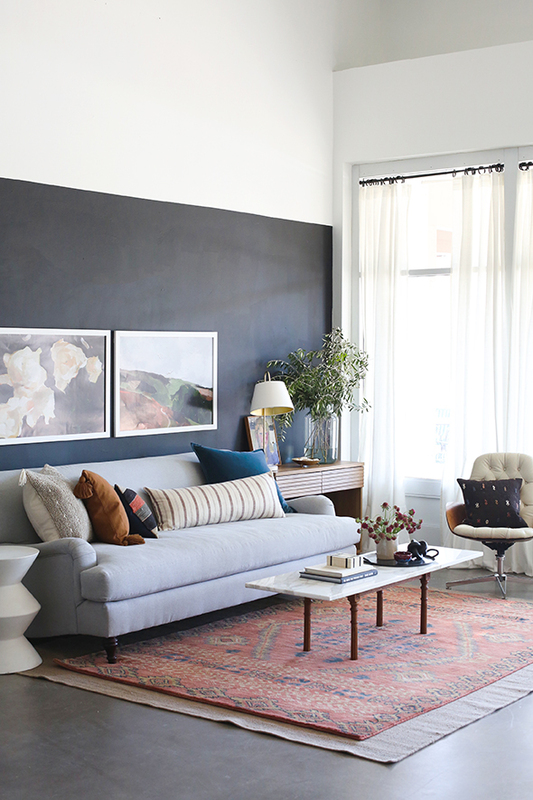 TIP #2: Take the time to put up actual paint samples on your actual walls. Every room shows color in different ways depending on your lighting, which mostly has to do with window size and placement. It’s so important to see the colors you like in your space at different times of day, including with the lights on at night! 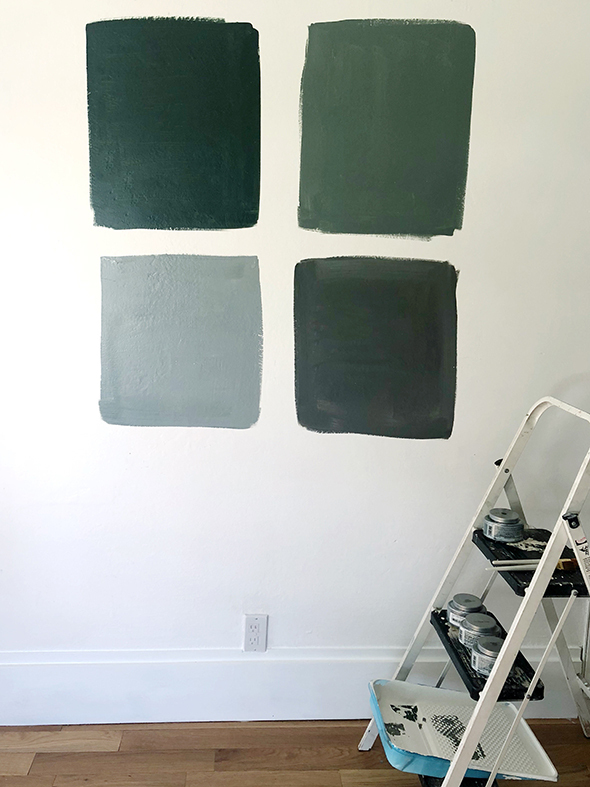 I really loved the bottom left color on the paint chip (Cafe Blue by Valspar) but as soon as all of my samples were up on the wall, the top right color, Coastal Dusk, immediately popped out as the winner! 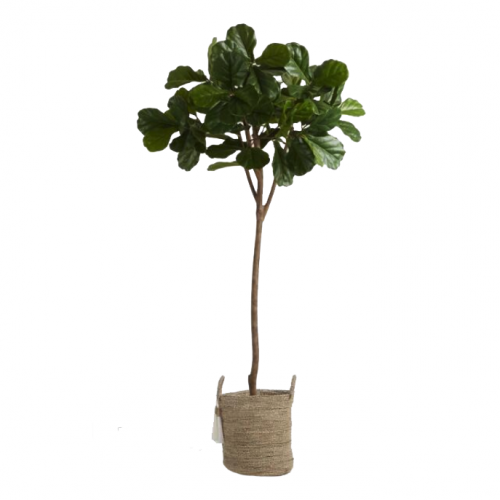 It was the perfect shade of muddy green gray that really helped to tone down our orangey floors. TIP #3: Pay the extra couple of dollars for the Premium paint line! You’ll probably only need to put on one coat this way and you’ll end up saving tons of time and money! I only needed one gallon of Coral Dusk in Valspar’s Signature paint in Eggshell for this bedroom. Here are the other supplies I like to pick up before starting a painting project. I’m a minimalist when it comes to painting and like to keep it to the best basics! Blue microfiber cloths – I LOVE these for all types of cleaning as well as my paint projects! 6×9′ dropcloth – I don’t usually drip or spill when I paint (years of practice under my belt!) so I often go without a drop cloth! But this is the one I use and really like when I do! 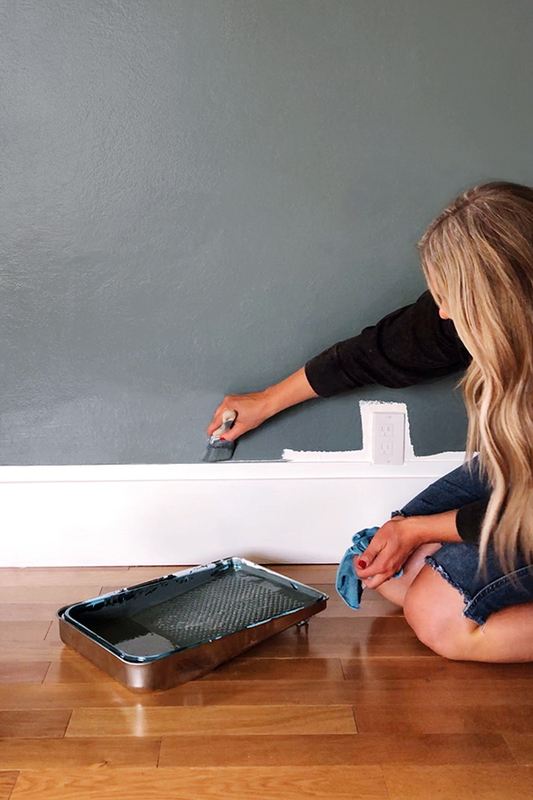 TIP #4: I touched up my trim with semi-gloss white paint first before painting my walls. Then I have found the quickest approach is to start with rolling before brushing on/cutting in. 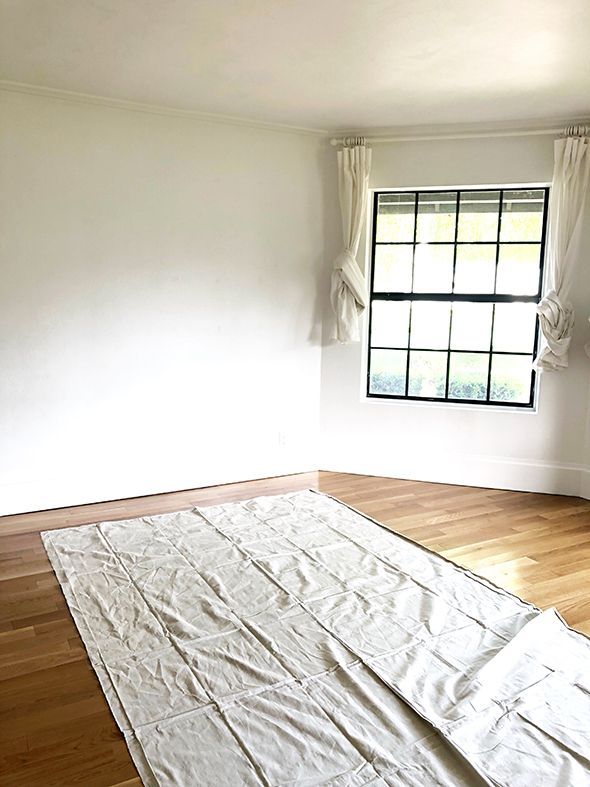 The very best trick I can share with you is a little something I like to call the 3×3 foot rule: every dip of the roller will cover 9 or 10 square feet (or about a 3×3′ square) with great coverage and no drips. 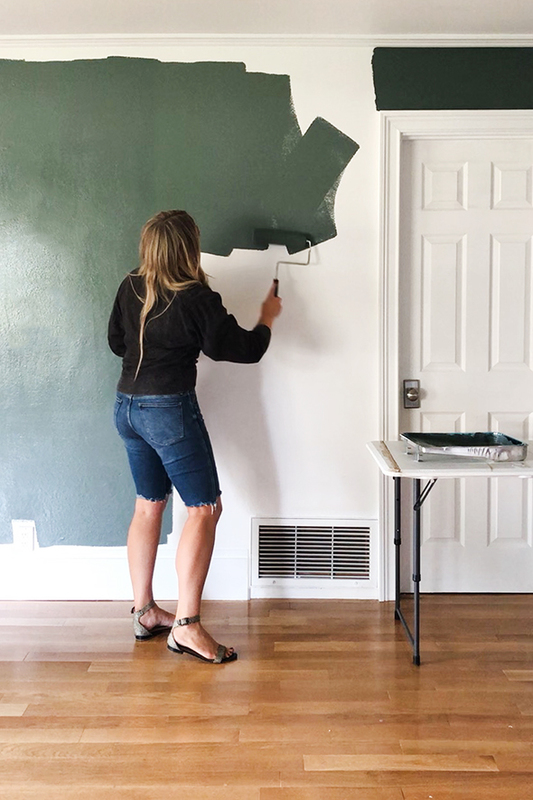 If you work in slightly overlapping squares, taking your roller close to your trim, you’ll be done rolling quickly and will only need one coat! This is especially true if you buy a premium paint, like the Valspar Signature line with a built in primer. This paint rolls on like butter! TIP #5: After rolling, use a 2″ angled brush (this one’s my favorite) to cut in your edges next to your ceiling and trim. This specific brush is magical and makes painting straight lines so easy! I haven’t used painters tape for years once I started using these brushes and my wonderful blue microfiber cloths as insurance in case of drips or splatters. It only takes me about 45 minutes to paint a bedroom with this method! It’s a BREEZE! 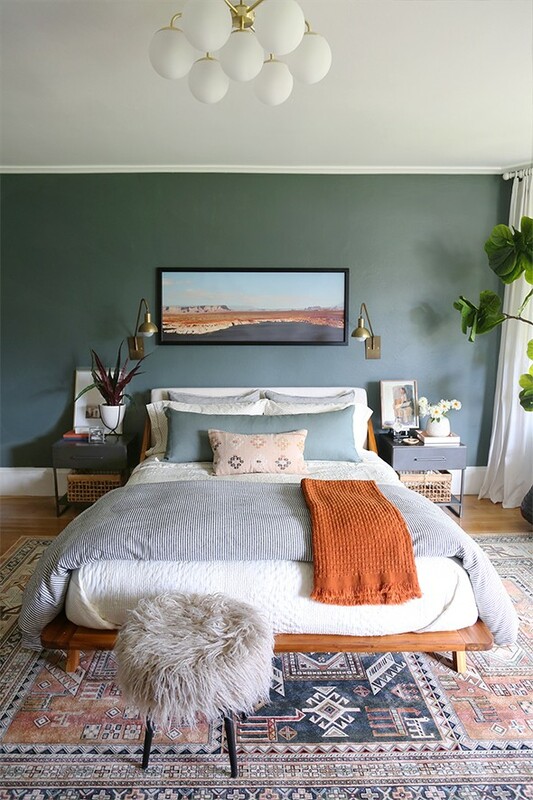 And since paint is so affordable, I am not at all intimidated by using adventurous colors like this dark green! I’m truly obsessed with the finished look, but if I’m ever ready for a change, I know it’s not a big deal at all to switch things up. Here’s a little photo tour of this finished space! We are working on putting together a second post with all the sources (and new prints!) in this space, but let us know if you have any questions in the meantime! And let me know how my approach to painting a room quickly works for you! When you say “3 square feet,” do you mean a 3×3 foot square, or a 1.75×1.75 foot square? The latter seems kind of small, but 3×3 is actually 9 square feet. Sorry – you’re right! I’ll update the post! I meant a 3×3 foot square. Thanks! 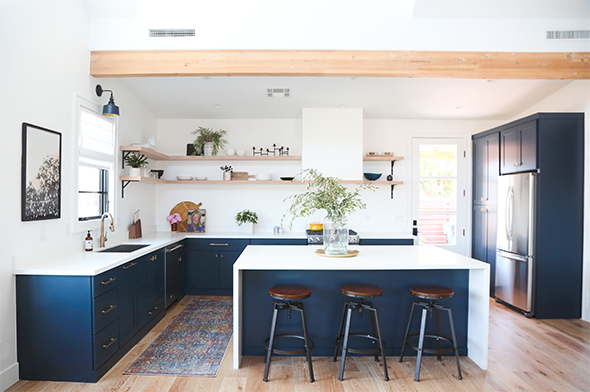 Source on the light fixture please?? 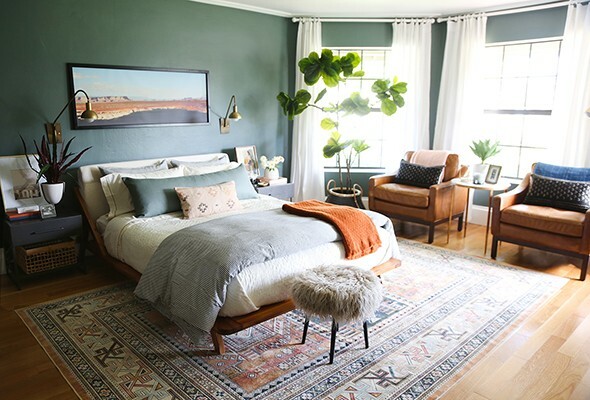 I’m pretty sure I need to recreate this whole room! I would love to know where the arm chairs are from! Man I wish I’d read this post about 4 days ago before I decided to tackle a painting project! 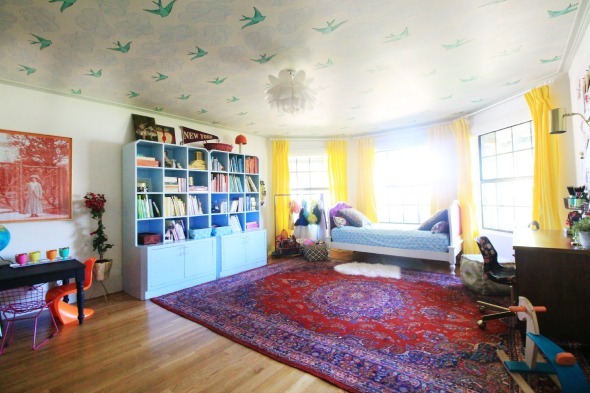 The room looks gorgeous—you showed admirable restraint choosing the color. I would have been tempted to go with the darkest green but the way it turned out is perfection! Which is great because while I’m kind of devastated to hear that precious wallpaper (along with those vibrant dyed yellow curtains!) only exist online now, what you’ve done with it…! Wow. painting my bedroom next week…why roll first? My hub will look at my kinda funny (and tell me I’m doing it all wrong) if I don’t have a good answer. How does this make things go faster? It’s faster to roll than to brush, so I roll on as much as possible and then just use the brush to touch up along the trim. Hope that makes sense! What is on the ceiling? And how do I do it? Would also love to know source on those gorgeous arm chairs! But you’re just painting around the electrical socket cover?! Great painting tips! Can’t wait to try it! LOVE! Where are the night stands from? This room turned out absolutely beautiful. It has given me the itch to paint something. Please share where the picture over the bed is from. Thanks! Source on the sconces? Love them! 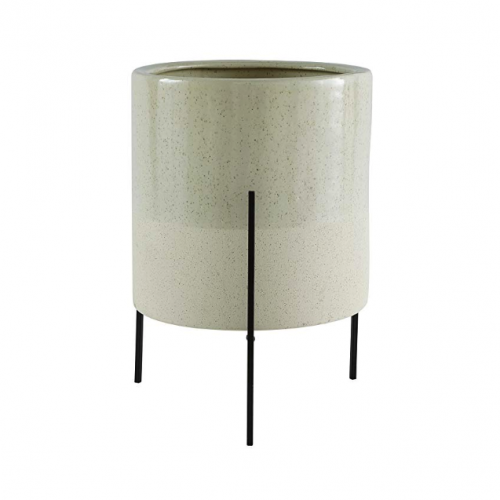 The sconces are from Lucent Lightshop! Great tips! My favorite angled brush as well. The room is gorgeous. Looking forward to the follow up post. But LOVE that the green diy dresser is back! 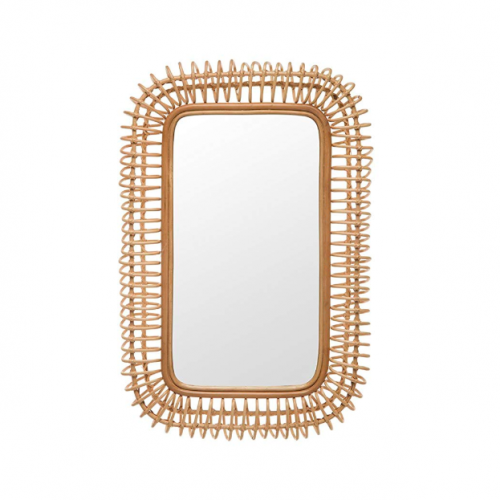 Would love a source list of all your accessories. Is that panoramic painting from your print shop? Love the sconces as well! Hello! Are you able to link the rug, please? This is so helpful. My entryway has been half painted for 9 months because I just can’t bring myself to go through the taping process (it is the worst). I’ve also been wanting to paint one of the walls in my living room, but the taping has held me back there too. I am going to have to pick up a good angled two inch brush and get to work! WAIT. You cut-in the baseboards, the ceiling, around three windows AND painted the walls in 45 minutes?? Yes ma’am! The key is rolling in as close as possible to the edge! Cutting in is the slowest part! Way to make knee length shorts look good. I’d given up on them. Haha…that’s what I got out of this post too!! 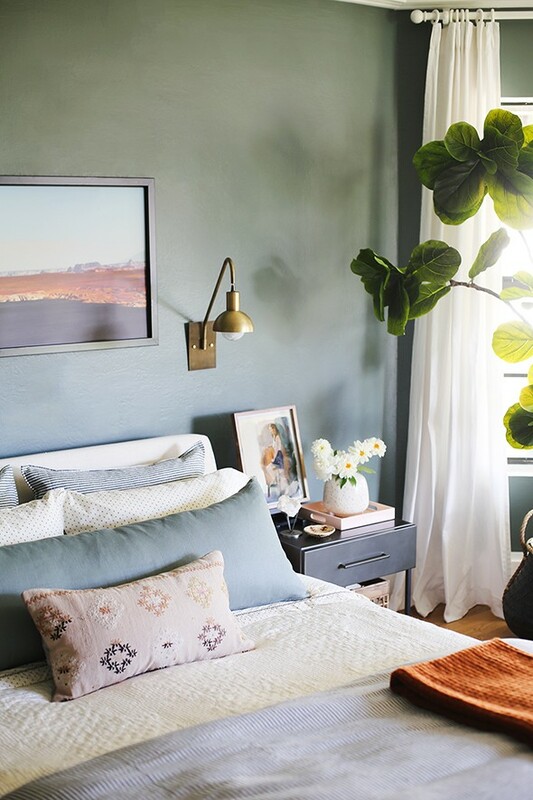 This color is stunning and the perfect green for a bedroom. We have decades worth of paint built up on our walls and trim. Any tips for prepping that for a new paint job? Some of it is so gloppy and thick. Beautiful! Nicely done.I was wondering where your curtain rods are from? I didn’t see them sourced on the blog. Sorry if I missed this.Thank you! Hi Jenny! I love that rug and am interested in it for my living room. Do you think it would look good with greys? I have a grey couch (up on cute little midcentury wooden legs) and am going to paint the walls a light grey (from this yucky basic beige). I can’t get a sense for how the rug would play with cooler colors. Would love to hear your thoughts! Thank for sharing the recipe ,its look so delicious http://happywheelsbest.com!